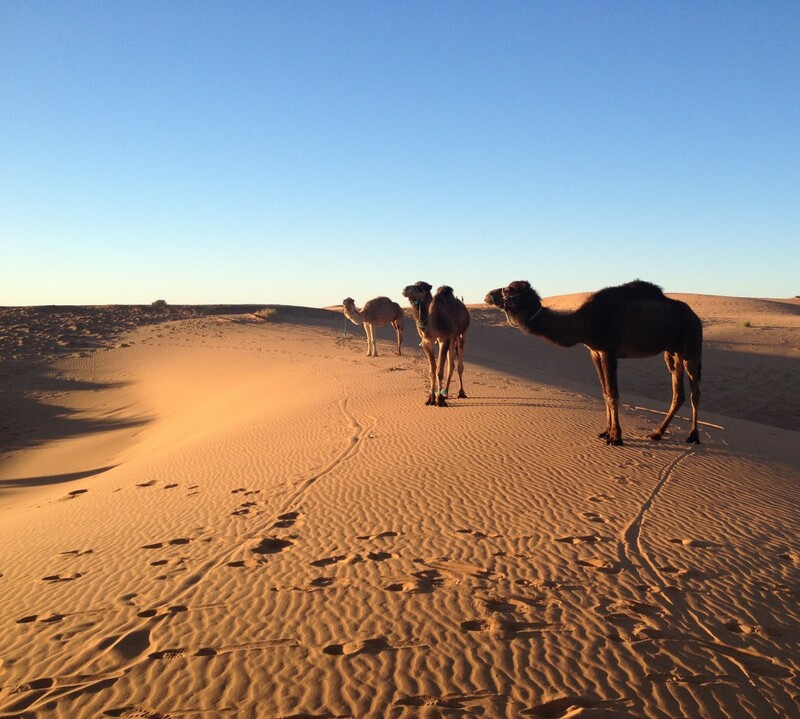 I had arranged through my hotel in Dakhla to have a driver take me across the border. I thought it was a bit pricey (350DH, about $50CAD), for being 1 of 4 passengers. But, it turns out that it was just me and the driver. Which is ok for that price, but I would have preferred to share the cost! We met at 8, but we spent a good couple hours running various errands for him (vegetables are very expensive in Mauritania, so we were stocking up for his family) before officially departing around 10am. Within 20 minutes, this middle aged guy had decided that a) he was going to call me Mariam, because Megan was too hard, and b) that I should be his wife. He didn’t seem to think much of my “husband” Kyle, though I’ve got that story so well-rehearsed now that I know he didn’t doubt the validity of my claim; he simply didn’t care. Eventually, off we went. The drive was actually quite spectacular. Lots of brief, yet beautiful views of the ocean, set against vast expanses of white sand (why it’s white here and orange farther north, I’ve no idea). Gorgeously weathered rocks. Great white dunes appearing out of seemingly nowhere, shrouded by a whirlwind of dust. There was even a man in a tractor who looked to be employed solely to manage a particular dune’s tendency to spill across the road; I wish I got that photo. As well, set a personal record for biggest camel herd seen; there were so many! 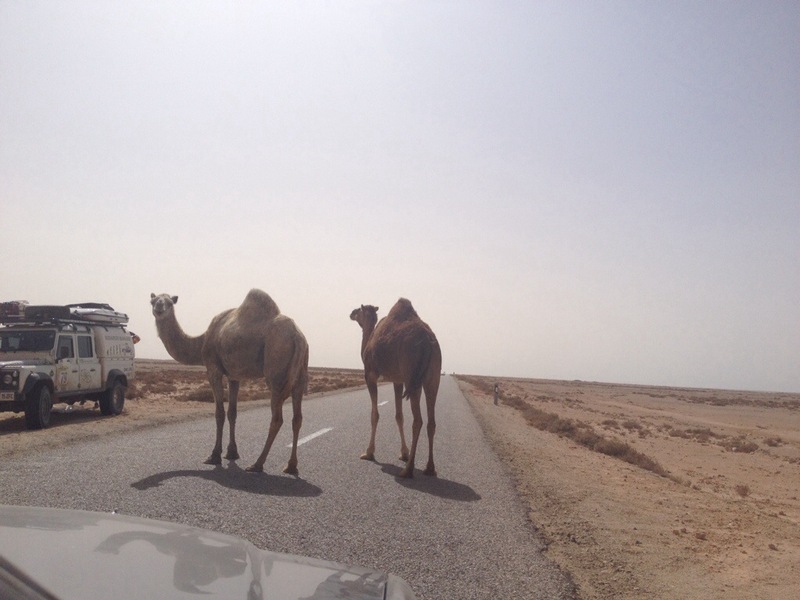 A few times we had to shoo some off the road – something that’s followed by a chorus of that peculiar sound camels make, which is something akin to a broken foghorn. After tea here, and tea there, lounging about the floor with random strangers (or the drivers brothers), we arrived at the border. And, man. I thought there were a lot of roadblocks on the way, but I hadn’t seen nothin yet. The border is a bizarre and slightly terrifying place. It’s not meant to be, I’m sure, yet it is. It’s so very typically African (on the Moroccan side), in that within the span of less than 100m, I had to check/register my passport at least 7 different times. My driver had by this time decided that it was somehow easier to tell the officers that we were married. Now, I don’t know about anyone else, but to me, a poor, unattractive saharawi man who does not speak English, claiming to be married to a young Canadian woman, does not define the way to make anything easier. He said it was to keep the guards from hitting on me, but I can say that it didn’t make an ounce of difference. Especially when they found condoms in my bag; I’m sure it was the highlight of their day. 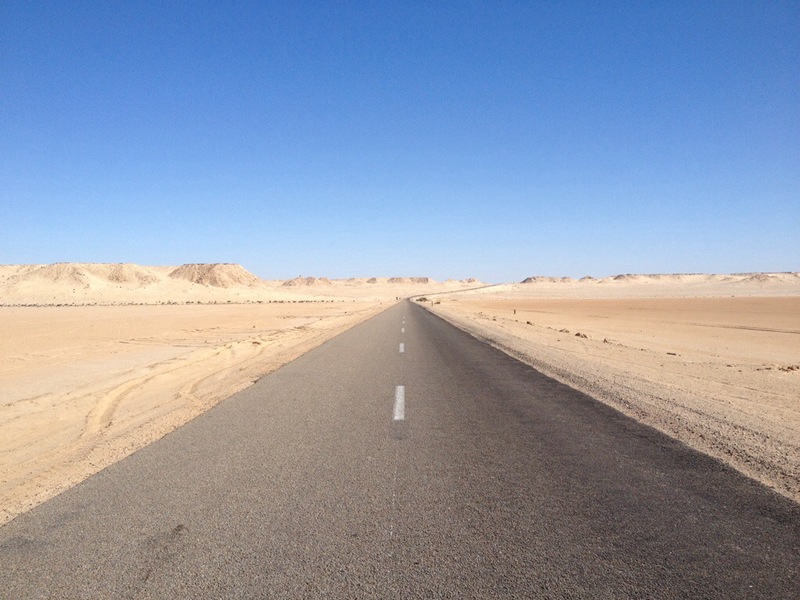 Finally we make it out of Maroc, and we enter no man’s land. Immediately, you know it belongs to no one; it is a wasteland of trash, abandoned cars, televisions, and various other electronics, all stripped bare. There are a million tracks in the sand, and I’m instantly enormously grateful that this new “husband” of mine knows where he is going: I know that the earth here is peppered with landmines. My god this is sounding quite dramatic, isn’t it? All I can say is that it was an incredibly fascinating and bizarre place to witness, but not somewhere I’d ever want to spend a lot of time. I think my driver can tell that I’m grateful for his navigation through that place, because he spent the remainder of the drive asking me if I would sleep with him (referencing the “protection” I have in my bag), communicated through a combination of crude hand gestures. Upon arrival in Mauritania, it was pretty standard.. register the passport here, buy the visa there, re-register the passport here again, check it at the gate with the police, and another 500m down the road with the military, and another 5+ times in the 20km to town… Standard. What I hear is that Mauritania had recently had some terrorist activity (as well as ongoing threats from the Polisario thing happening in the north, and also spillover from Mali’s conflict). The impact this has had on Mauri’s economy is so great that the government wants to do everything it can to keep visitors safe. So what this means for me is that no matter how I’m travelling, I will always be the one passenger that gets out at least every half hour, to confirm who I am. Anyways, it’s definitely Africa here. I said before that I was worried about not being able to handle it down here, but in some strange way, it’s almost like I’m more comfortable here, even though it’s way less accommodating. Morocco and it’s stable, tourism-based economy raised my standards, but it seems I’ve been able to apply them to Morocco only. And it’s a good thing, too, because I suddenly have a lack of sheets and blankets, and an influx of cockroaches, but I don’t really mind.